Accordions and Amplifiers and my Mic System. 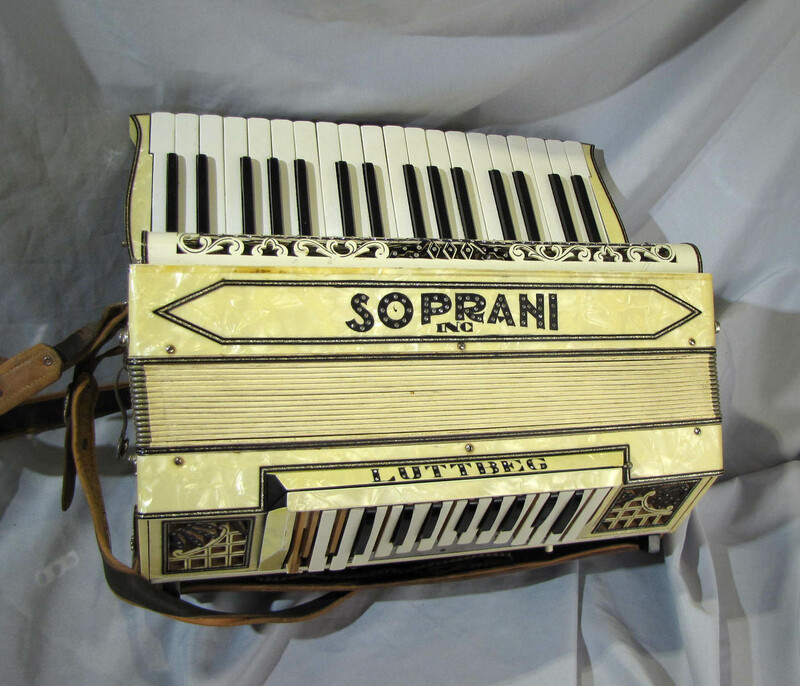 Like many instruments, accordions have trouble keeping up with louder and amplified instruments and over the years people have tried many ways to amplify their sound. One of the earliest accordion amplifying techniques is the crystal microphone, which was starting to come into use by the late 40’s. Crystal mics were relatively small and inexpensive so a good system could have 6-7 mics with stereo separation of a sort, with separate tone and volume control for the left and right sides. Simpler crystal mic systems had as few as one mic and no onboard volume control at all. Crystal mics vary in quality and their response is uneven through the audio frequency range. What’s more, response of these mics can deteriorate over time and in some cases they can die entirely. I will occasionally install crystal mic systems in accordions for people who need a vintage sound and I often have to sort through old sets to match up a new set . They can also have a strange echo at the end of each note, but placement of resistors can help. Condenser mic systems for accordions are a newer type and have been around since at least the 70’s but they too run into some of the same problems that installers found with crystal systems: there is no such thing as a standard accordion so there can be no standard microphone system. Some systems appear to have been designed in a lab by somebody with little experience with accordions and can suffer for reliability issues and no troubleshooting support. It takes 5-6 hours to install one of these mic systems and then they weren’t always reliable, which added on even more hours of (unpaid!) work because of the warranty I offer Most mic systems were not adaptable to the many variations of accordion construction and many older accordions have no clearance under the grill, and finding a location for the output jack can be a problem. In response to these problems, I designed a mic system of my own: With modern tech the boards did not need to be large, but I did want the solder points to be accessible to normal soldering tools and wire. Plugs would be industry standard and findable in the future for service. The mics would be on wires so the board could be put in whatever space was available and the mics could be placed for optimum sound. I find that internal mics under the grill are best for performing accordions because the closer you can get a microphone to the source of the sound, the less likely feedback will occur. The microphone capsules are directional by design so they are less sensitive to outside noise than sound from the accordion. A obvious solution would seem to be to place the mics inside close to the reeds like some of the older crystal systems. Condenser mics can’t generally be placed inside the accordion as the changing air pressure will eventually damage them, and will cause distortion. 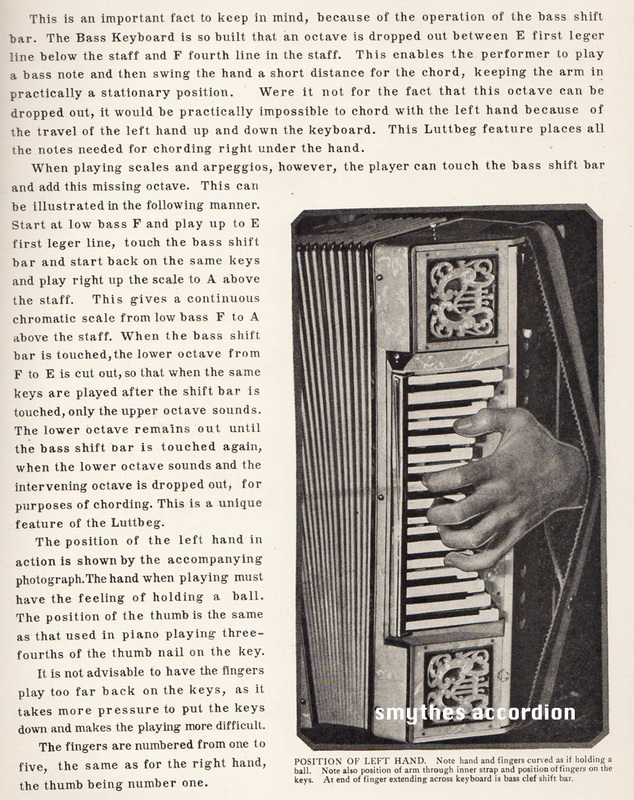 It is also difficult to get separation of the left and right side of the accordion this way. Separation is achieved by placing mics under the grill and inside the bass machine area, a nice side effect is separate volume control that will allow you to do things like use only the piccolo reed on the right and the master register on the left. This setting would be unusable on most accordions as the piccolo would be drowned out by the bass. With good separation you can turn down the bass to match the output of the keyboard. This will sound unbalanced on the accordion but will sound fine coming out of the amp. Don’t forget that amplifiers have a big effect on the sound. Standard solid state guitar amps can make almost any accordion sound sharp and metallic. In a pinch a bass amp will give a better sound overall. Keyboard amps are better than guitar amps in most cases but they seem to vary. I have been really happy with the sound of tube or hybrid amps because they seem to warm the tone somewhat and generally sound better with accordions. Rust on accordion reeds is something I run into from time to time and opinions are varied about what to do when it occurs. Rust happens for a couple of different reasons, most of them due to moisture (I will get into the exception later). Rust starts to occur when the general humidity is over 45% but steel is a bit more resistant and blueing helps a bit too. Dew point is a big problem; when the temperature of a surface is below the dew point of the surrounding air (you left your accordion in the cold car then brought it into the stuffy hot club and started to play at once) moisture will condense on the cold surface of the reed. Dirt and salt can also hold moisture and tend to make rust more likely by keeping the moisture there longer. (e.g., playing near the ocean for extended times). I can often tell how the rust occurred by where the rust is. For instance, rust on tips of reeds is often caused by playing outside in damp environments. I get this from accordions that are played on sea cruises. Rust on just one side of the inside of an accordion is often caused by being stored against a cold surface like a exterior building wall , or a cold floor. Closets are good storage areas as they are almost never against outside walls for just this reason. This type of rust take months to form and possibly years. The worst is when the instrument was in a basement that flooded on occasion; this usually leads to bad rust especially on the bass side, and corrosion on the outside of the instrument (and its case’s hardware). Specifically, the wood bass plate and the instrument case will have warped and delaminated, and the bass machine of the accordion will have rust and corrosion. There are several ways to deal with rust. For small spots or a thin dusting, scraping or sanding the rust off and keeping the instrument in a dry location after will take care of the problem. It is not really true to say that once you get rust it will keep coming back. I think it is more that the instrument gets returned to the environment that caused the rust in the first place, so it comes back. Rust is hydroscopic and will tend to cause more rusting. The reeds will have to be retuned after the rust is removed. Desiccant packs in the accordion and in the case will a long way to combat further rust if you can’t do much about the environment. If you live on a boat, for example, you can keep the accordion in a plastic bag and keep the desiccant in with it. If there is actual pitting of the metal, the reed should be replaced because the amount of filing or grinding that would be required to get it back in tune may not leave you with much reed, and the pitting leaves weak points that may lead to cracks later. I have worked on old bandoneons that have reeds so thin that the rust made tiny holes through the reeds. This is often tolerated because it is very difficult to replace reeds in bandoneons. The odd man out here is Hohner accordions from the 1950’s to about the 1970’s. The outsides of these accordions can look flawless but the inside will have corrosion confined entirely to the area contained by the bellows. The rust will tend to be on the bottom of the reed near the rivet. These accordions also often have loose valves floating around inside the instrument and they will come off the reed plates with almost no resistance. The valves will be of the plastic type. I have run into many of these over the last 20 yrs and it was a bit of a mystery: instruments with almost no playing time often seemed to be worse in worse shape than working instruments. The mystery was solved about a year ago when I was dealing with some old movie film and I had to do a bit of research before trying to sell it. Many of the listings I found on eBay mentioned that the film “had no vinegar smell”. Well, vinegar is acetic acid, old movie film is a type of celluloid, and celluloid was the base for some early types of adhesives for this new thing called plastic! So it appears that this new glue is what Hohner used. The glue breaks down over time, the acid fumes collect inside the accordion, the reeds rust and the valves fall off. Or, if the instrument is played regularly, the fumes get purged regularly and the valves just fall off and get caught in the reeds and the instrument needs to be stripped down and rebuilt anyway. If you rebuild one of these Honers ALL the plastic valves must be removed (the valves with the leather type backing may use a different type of glue). You can often reuse the valves if the glue remains can be scratched off. The glue must be scraped off the reed plates. I used to work on jet aircraft in the early eighties and jet engines oddly enough suffer from the same sort of problems (some types of jet engines even have a type of reed). This website about jet engines has some interesting related info about rust: http://www.jetenginestorage.com/humidity.htm. Another interesting and amusingly written page from the British Royal Society of Chemistry is here: http://www.rsc.org/chemistryworld/podcast/CIIEcompounds/transcripts/rust.asp. I was going through several boxes of accordion sheet music when I stumbled across this. 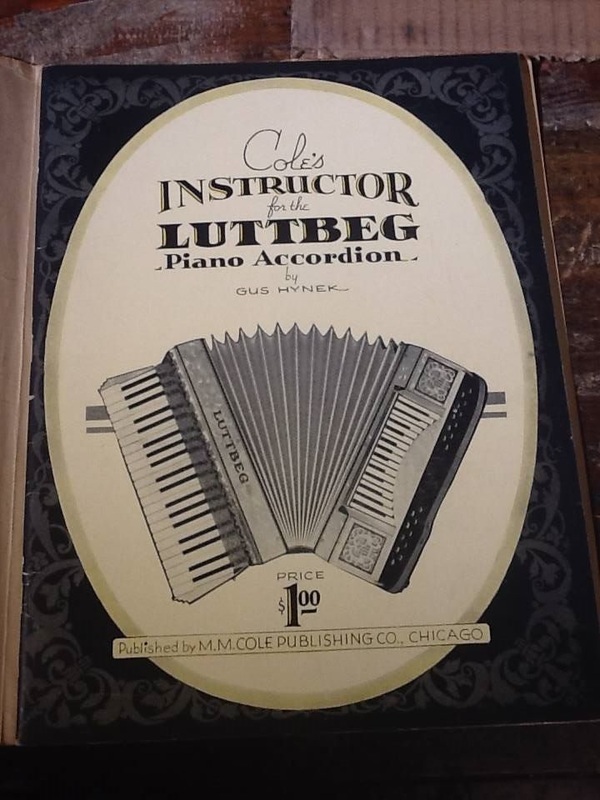 I had seen several dual keyboard accordions on eBay and elsewhere over the years , but never a book on one. Max Luttbeg was a wrestler from Russia who later went on to play the accordion on the vaudeville circuit. He later gave up on the system and came up with a freebase button system with 36 buttons but it is not clear how this was laid out. The book dates from 1935 but a little research seems to imply the the first one built by Soprani was from 1931. Apparently only about 12 were built and not all by the same company. From the pictures you can see that a second strap inside the bass strap has been added to give more control and keep the hand in one place. Since you only have about two octaves on the left you have a shifter bar that allows you to shift up for chords (second image). Depending on what you play I think you might have needed this more than was convenient. The book also has a pullout by Edd Clark for a "Model A" that was a compact version with 25 keys on the right and 14 on the lefty and was called the "duo-organ" and he explains that this setup makes it possible to play piano music as it was written. This type of left hand keyboard is an idea that has come and gone several times ,and seems to make sense but in reality is pretty hard to master and does not bring any real benefit over the systems being used currently. Versions of accordions have been made with a inner row of bass buttons in the pattern of the black keys of a piano to simulate the black keys ,and a row of white buttons for the white keys , this has been in use for many years on a small number of ethnic instruments in Serbia and but has never really caught on elsewhere. November 18, 2016 Luttbeg day! This guy was purchased by our shop last week. A pretty rare find indeed! I am Kimric Smythe owner and operator of Smythe's Accordion and general all around tinkerer.